In my last blog I spoke of two people who were bodhisattvas – warriors of compassion. In the face of cancer and mortality, they took steps to ensure their love remained greater than their fear. Like a sailboat in a storm, compassion became a keel which balanced them against the strain of suffering and struggle. It enabled them to use the energy of fear to move forward instead of capsize. We tend to think of compassion as a gentle, kind intention. It is anything but. Compassion is the ultimate transformative force in the world, the very essence of God’s love for us. We overlook that as we pray “Lord, have mercy” (Kýrie eléison). A more accurate translation would be “Lord, have compassion.” What a difference! The first brings to mind the image of a judge presiding over you, the second of an embrace comforting you. And that’s exactly what God does, for the heart of the Christian message is that God comes to us as one of us to suffer with us in order to transform us. Think of a 12-step meeting. A person stands up and says “I know your pain. I know the struggle. And this is what I did with it – I used the crisis to deepen my humanity and amplify my love.” That is the divine agenda on Earth, and it is embodied through us. To work with suffering in this way is nothing less than conscious evolution. Focus on what you struggle with; a thought, feeling, or issue. It could be physical or emotional pain, fear, worry or any kind of distress. Locate it in your body. Viscerally connect to the experience. Breath in more of this from others. You can start with one person, then expand to a group, a city, your country and beyond. Take in more of what distresses you. Breath back compassion. You can send this as a heart-felt message: “I understand.” Connect with more than kindness. Connect to them with solidarity. You know how this feels, and you are with them. The goal in this exercise is not to be good or strong, but to be real. Authentic. Connected. Compassionate. “My power is perfected in weakness.” (2 Cor. 12:9). This how we, as wounded healers, are also saints, bodhisattvas. That’s how the light gets in. Question: What is it like for you to be a warrior of compassion as you use your weakness to connect with a noble strength? 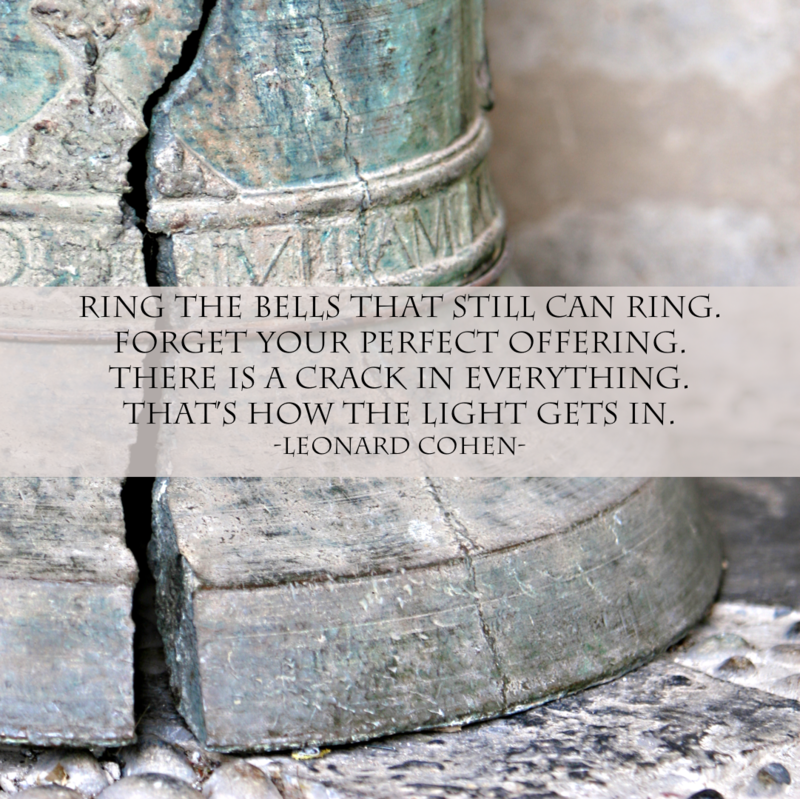 How will you let the light shine brightly through the cracks?